"As soon as you drive up to 117 Courtside, you will be greeted with a warm Hilton Head Welcome! After vacationing at Courtside every year for 10 years, our family decided it was time to purchase a villa. We completely renovated it during February-May, 2015 and look forward to sharing our joy with you as a Hilton Head vacationer. As you walk into the entry, you will see a bright and cheerful place to stay and you will be captivated by the pool view from the first floor and the master bedroom. 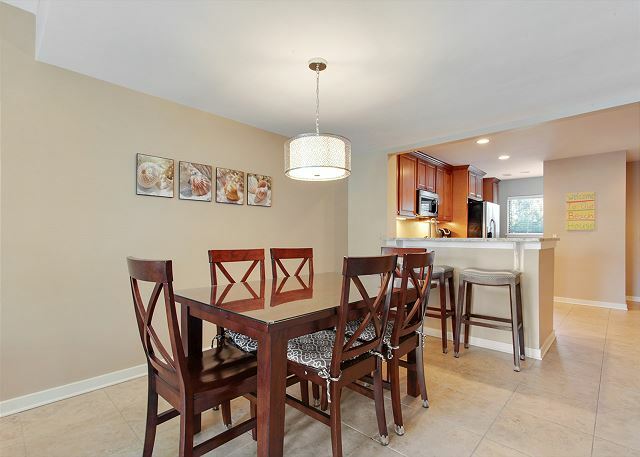 The kitchen was completely renovated down to the wall studs and a wall removed for a more open floor plan. New maple cabinets with under-cabinet lighting were installed. Beautiful cream colored granite and stainless steel appliances were added. There is a full-size washer and dryer located in the kitchen for your convenience. Brand new dishes, pots, pans, silverware, glasses and everything you need to make a meal is available. New furniture, including a queen-plus sofa sleeper with a foam mattress and no bars, was purchased for the living room. The dining room has a new dining table with six chairs and three bar stools set up for the eat-in bar area. The master bedroom has a new king size bed and the other bedroom has two new full-size beds. Both bedrooms have new boxsprings and mattresses used at Marriott for your comfort, along with their own nicely decorated bathroom. The 2 upstairs bathrooms and the downstairs powder room were completely renovated with new toilets, sinks, lighting and custom vanities. Brand new clean tile replaced the carpet throughout the unit. The unit is ready to go and to be used for your enjoyment. There are three mounted flat screen HD LED TVs with cable in the living room and both bedrooms. The living room has a blue ray DVD player. Wifi is provided for your "surfing pleasure." A beach cart is ready to be wheeled to the white sand beach that is only a 5 minute walk away. Bring your tennis equipment because you can enjoy an hour of free tennis daily at the world famous Van Der Meer tennis center across the parking lot. There are new chairs on the patio overlooking the pool and the pond if you just want to rest. Coligny Beach with great shops, unique restaurants, large swings and a sprinkler play area is a short stroll down the beach. Of course, bikes can be rented and enjoyed on miles of bike paths on the island or tee times made at world class golf courses. For an unforgettable experience, there are so many things to do if you want action and nothing that has to be done if you prefer a good rest in a comfortable setting. 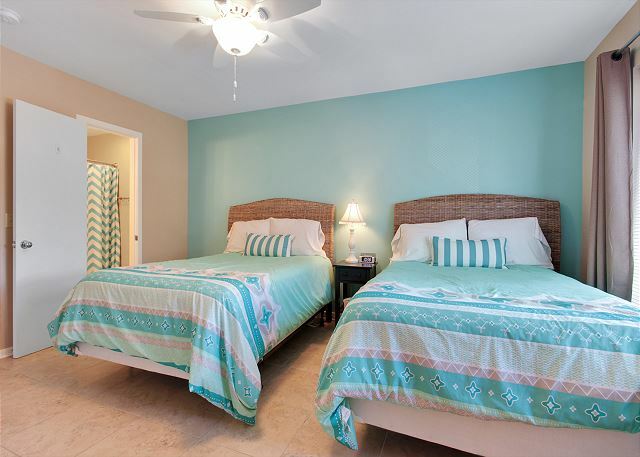 Seashore Vacation Rental Agency will ensure a smooth planning process and are available to assist you while your are on the Island at Courtside. This was a great launching spot for all things we wanted to do in the low country. Everything in the unit was clean and functional, we did have a slight issue with some electrical in the MB, but they got it taken care of. One slight issue with some maintenance personnel who came unannounced to change some HVAC filters, would have been nice to have warning on that. Otherwise, things went as stated and the property managers were quick and efficient and helpful. Very nice place to stay - decorated well with nice furnishings, comfortable beds, and an upscale kitchen...picked this unit because it was off the main road and more quiet than condos on Forest Beach Drive. 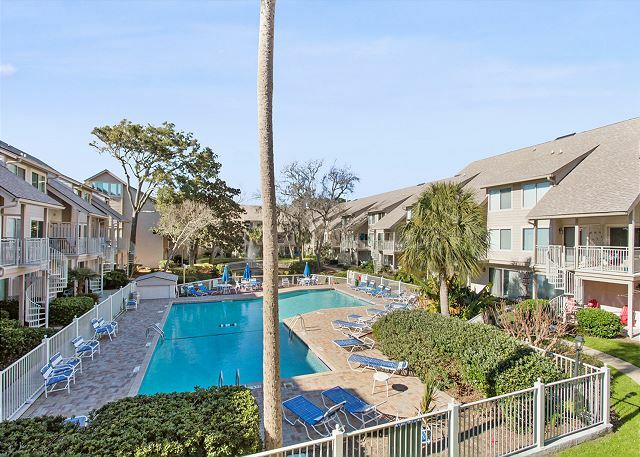 It is a 5-10 minute walk to the beach and in the center of Hilton Head with lots of great restaurants and shops - Reilly's and Marley's offer great food and a popular happy hour. Hudson's and Skull Creek are also awesome on the North side (take the cross island freeway for quick access). Walking and riding bikes on the wide beach is one of the best features of HHI - this condo is ideally located to explore other plantations and the Sea Pines Beach Club and Salty Dog restaurant. 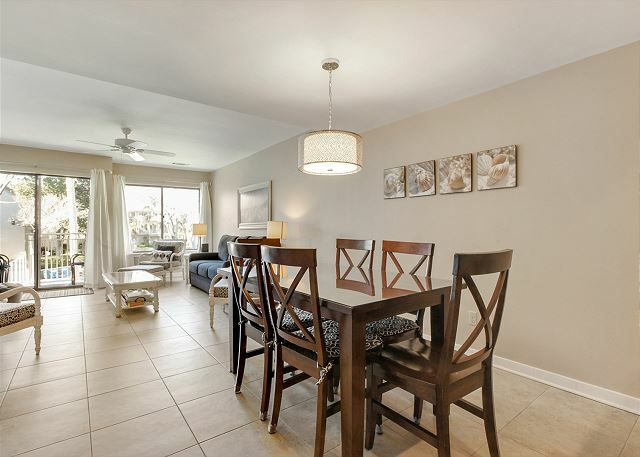 Updated, clean Townhouse on south end of island very close to beach & Coligny Plaza. Very accommodating! The renovation looks awesome. Would recommend this unit to all my friends and family! Great place, great location !!! We have stayed at Courtside before, but this is the first time in 117. Everything was as described and was very clean, and we had everything we needed. The kitchen had all the basics but no pizza pan. (No one ever seems to stock a pizza pan...what's up with that?) There were some beach chairs and other beach items that we were not expecting so that was a welcome surprise. The only issue was the exhaust fan in the second bathroom was not working. Not a big deal, just got steamy when showering. We reported this to the management company when we checked out. Overall, a great place with a five minute walk to the beach and it overlooks a great pool area. Definitely stay here again. We have stayed at Courtside before, and we really enjoyed staying in this unit. Like others, we found it to be clean. It was also tastefully decorated, but did not have too much "stuff". Of course it had a great view of the pool and was very convenient to the beach. We enjoyed greatly enjoyed our stay. We would stay at this unit again. I would only add that some dishwashing liquid and extra soap would have been appreciated as our family was there for a week. This condo was fabulous! Great location, 7 min walk to the beach and 10 min to coligny circle. Very clean and nicely decorated. Had a great pool literally steps Away from the condo. Check in and check was so easy. I really have nothing negative to say! Only wish we could have stayed longer. This was our first vacation rental ever so we were nervous about what to expect. The info prior was thorough. The check in process with the app was so easy. When we got to the property we liked the parking access. When we entered we were blown away. Super up to date, clean. It is a well supplied rental. Felt like home. One of the most helpful things was the laundry baskets supplied. I know it sounds silly, but they helped keep us clean and org anized. This was the first vacation we had clean clothes the entire time. We really had everything to cook. The only things we wished we had been notified about is that there is no grill, and that the pool isn't heated. We happened to have three cold days (50 degrees) and the pool was freezing. There was actually a sign on the entry that says it was closed but the sun deck was open. My kids swam anyway but only for a short time each day. I honestly would have picked a different property if I had known it wasn't a heated pool. Not having a grill limited our cooking options so that was a bummer. I would definitely rent this place again, but likely a different time of year. Fyi- the walk to the beach was only 4 minutes and to the town circle about 8-10. Our stay in Courtside Villa, Unit 117, was very enjoyable. The condo was very clean, we really liked the open kitchen and newness of the kitchen. The beds were comfortable to sleep in and loved the floors. Thank you for everything in helping to make our stay enjoyable. loved everything about the condo! Location, price, cleanliness, spacious. If I could change one thing it would be the extreme high temps - never even cooled at night. We have stayed at several different units at Courtside and found that 117 is one of the better ones. We always keep track of the units we stay in and couldn't get into one of the ones we liked. 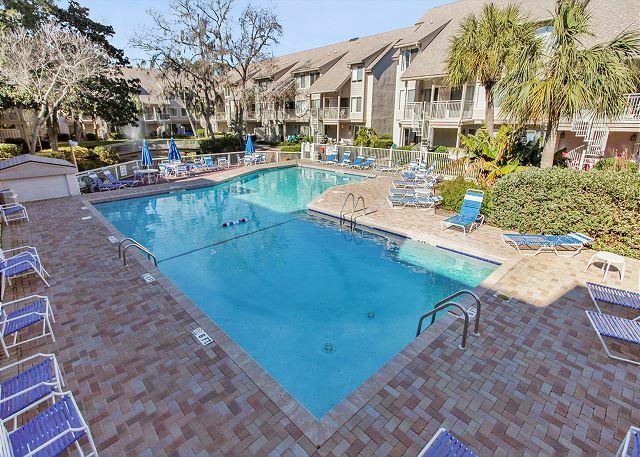 117 is going to the top of our list for our next Hilton Head vacation. We enjoyed our stay. The absence of carpet made it feel very clean. nice place. Couldn't find a simple broom, but no worries. We had everything we needed for a great stay. Location was great with respect to the L-shaped pool & the beach. fantastic weather and very comfortable unit. Good choice when you travel with family and would like more space for everyone. The patio door was not working so could not go out from there. We will gladly respond and fix any issues when reported during the stay in a timely manner. Unfortunately we were not made aware that the input on the remote was on the incorrect setting (occurs when folks change device use), and the sliding door has now be reset on its track. We hope this guest will return, and we will address any needs while they're here. 117 Courtside is very spacious for a family of four. The unit is updated and well maintained. The property management company. - Seashore Vacations - was professional, responsive and provided clear instructions/information. 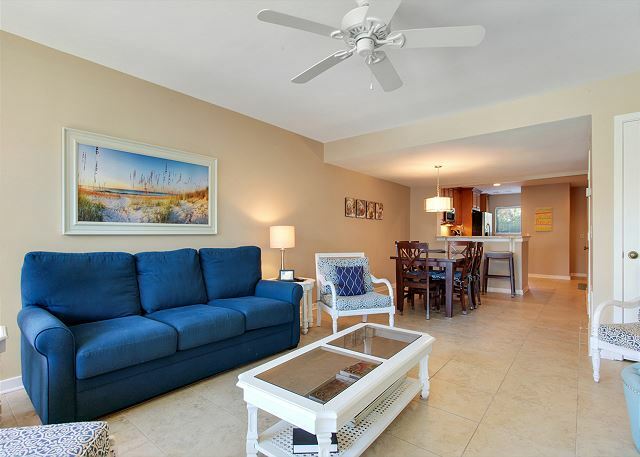 Courtside is centrally located on the island and only a short walk to the beach. Pool and grounds are in good shape, and other tenants are friendly. Highly recommend this unit if you're looking for a bit more room, in a good location that's not right on the beach! Clean, modern and comfortable. Very convenient to stores and long walks on the beach. best courtside unit we have ever stayed in. This place is wonderful! We enjoyed the beach, which is only a block away, every morning. This unit was really clean, had a nice kitchen and bedrooms. Loved the decor. My family and I took in the beautiful scenery and several marinas and restaurants. One of our favorite things was a sunset sailboat cruise out of Harbor Town just a few minutes away. Definitely hope to go back! Thanks for a memorable trip! We love Courtside 117! Tile throughout and upgraded kitchen are excellent. Kitchen has great cookware in good condition and is well appointed. It was not as clean as it needed to be upon our arrival but property management was very responsive and the cleaning contractor responded as well. It could use an additional,comfortable chair in the living room and couch ready for an upgrade. Beyond that, a great place and we will return again! This is a very lovely villa. Granite countertops, up-to-date appliances and very clean. The detail accents to each room was versatile but correlated to that room. It had the beach feel but felt like home as well. Owners are very friendly and nice and really easy to work with. I would definitely recommend staying here if you are in Hilton Head. My family and I can't wait to stay again as well. It was our first time staying at Courtside 117 and we will definitely be returning. The unit was beautifully furnished in coastal colours which reminded me of the beach. It was also new and clean. The beds were very comfortable and the kitchen was well-equipped. The location was great - short walk to the beach, tennis courts and shopping. My family loved it. We can't wait to return! Very nice place. Only issue was the broken faucet in the tub of the second bedroom's bathroom and the mold around the tub...but that seemed to be in process of being fixed. So overall a very nice stay. The vacation was excellent. Hilton Head offers a different style of beach vacation with palm trees and pine trees all around with Spanish moss hanging from the trees. It is a great atmosphere where we used bike paths to take our 2 kids on trail-a-bikes all over the island. The location of Courtside 117 was just blocks from the beach, the owner had included a beach cart, with 2 umbrellas, and chairs-this was crucial. The 117 unit was a great 2 story unit with 2 bedrooms, perfect for our 2 kids and us. Everything was recently updated and renovated, nice furniture and newer appliances. The unit has a small balcony that overlooks the pool, we sat out on the balcony and ate dinner, snacks and had drinks. The only thing I wish was different is that they allow pets, we wished we could have taken our golden retriever with us, but with that said, the place is great and we highly recommend it to anyone. We would stay here again. We loved staying at courtside! We will absolutely be back! We loved everything about this unit, it had everything we needed! The unit was clean, nicely decorated, had a wonderful pool and was a quick walk to the beach! We also enjoyed using the tennis center. The unit was close to everything and a perfect fit for our family! The villa was beautiful! Very comfortable and classy. The upgrades are well done and we loved the open concept. Will definitely stay here again. Close to the beach and bike paths. This property was amazing--just renovated. Location and condo perfect for us. I love it very nice :) cant wait to booked my next vacacion. Very clean and spacey. Great location. Very nice accommodations and very convenient. We enjoyed our stay in this property. The property definitely needs more than a little TLC. The carpeting is extremely dirty to the point where our feet were black from walking around inside the condo. Many of the walls were splattered with food or whatever. In addition, there were water leak issues with most appliances. We were greatful to have a place rented to us a such a sad time and at such a great rate however, the house keeping crew should be addressed. We had a FANTASTIC vacation thanks to the people at Saeshores Vacations..They saw to every need.The location was perfect and the villa amazing..We will only use this company for future trips to the island..Bravo and Thank you..
We have stayed at 4 different condo's at courtside and 117 was our favorite at this point. thank you for all you do in making people's vacation a little easier to book a great condo with pitcures and answering any ? we may have !!! talk to ya soon for next year !!! This condo was excellent in every way. My only suggestion is perhaps a few more starter supplies (maybe an extra trash bag or two). This would make it easier for guests and not cost much. Thanks again for a great stay.